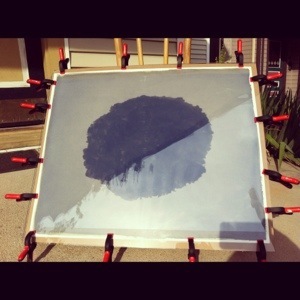 The cheap way to make cyanotypes without buying a 20 x24 split back printing frame. 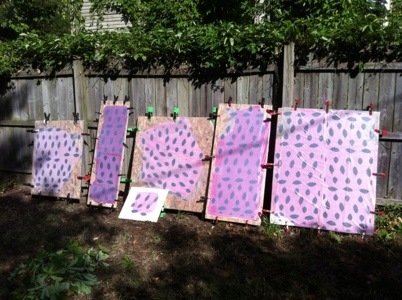 Here is the completed version of mis-mitosis (ash seeds). 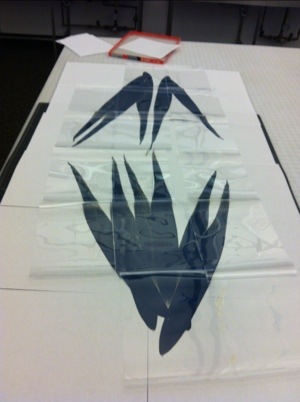 There are some irregularities to the way the paper was cut. I ended up using thin strips of exposed and processed van dyke brown prints to fill in the gaps. 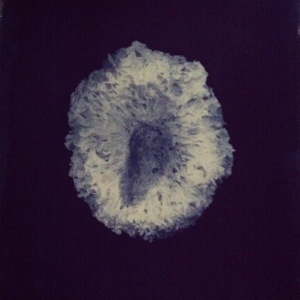 I worked on a new cyanotype fungus image and used the late afternoon sun for exposure. With the Coventry Rag Vellum White, my idiosyncratic inkjet negatives and traditional cyanotype chemistry, I obtained good print density with exposures of 12 minutes (at 5 pm) and 15 minutes (at around 6 pm). In a couple of days I should be able to upload a quick and messy cell phone snap of the prints. I do have an image of the newest piece for in vivo. I’ll post it tomorrow. Or just visit my website, www. frangst.com. In the meantime, just a heads up regarding the usual suspects, summer juried shows. Three pieces, Pluot, Japanese Pear and Honey Crisp, are part of the annual Fine Arts Exhibition at the Ohio State Fair. This is a great exhibition that runs concurrent with the state fair, from July 25th through August 4th, bringing in a diverse group of visitors (fair go-ers) to see work made by professional and amateur Ohio artists. An opening reception is planned for Tuesday, July 24th from 6-8 pm. Earlier this summer, I broke out of my comfort zone to work with an iPhone photograph which I printed for the 21st annual members juried show at Dayton Visual Arts Center. The exhibition is titled and themed No Borders. Look for my print just below a photograph by Janelle Young. This exhibition runs from July 13th through August 18th. DVAC has gallery hours of 11 am through 6pm Tuesday through Saturday. This is the layout for the next multi section van dyke brown piece I am making for in vivo. These are the negatives used for the print exposures done today. Thirty-five minutes per group of four. Tomorrow I’ll be processing about seventeen of these. I’ll have two extra blanks and four unexposed, coated pieces of paper in reserve because I do not work in a perfect universe. 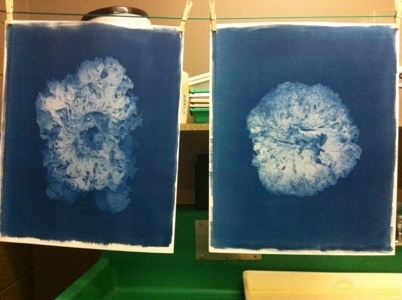 Two more cyanotypes drying down. I mixed up new chemistry yesterday to a avoid the strange dark patches that may be from mold in the ferric ammonium citrate. I am printing multiples to try some toning with gallic acid. In case you were wondering, I AM channeling my inner Anna Atkins!